Also known as Sheetrock, wallboard, plaster, plasterboard, gyp board, wall and ceiling panels - no matter what you call it for decades it has been the simplest and most cost effective way to cover studs and ceiling joist that are used to frame your home when under construction. If your home has drywall odds are sooner or later it will need attention or repair work of one kind or another. When this happens you have two choices, either do it yourself or hire a skilled, trained, professional drywall and texture contractor. Hiring a contractor is highly recommended because you can literally spend hours of time trying to fix holes or cracks yourself only to find the repair simply doesn't look the way it should after paint is applied. Hire a local drywall, wall, ceiling and texture contractor that has provided service in the area for over 26 years. A contractor with excellent references, fully guarantees workmanship and promises to keep and leave your home clean when the job is completed. 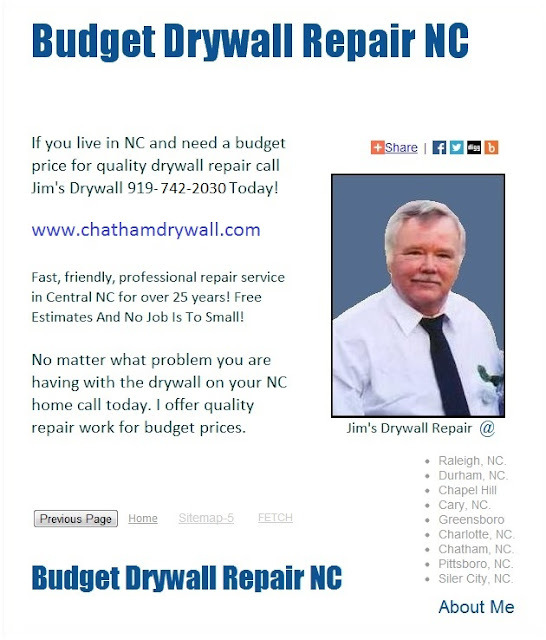 Drywall The Simplest Way To Cover Walls And Ceilings On Your Home in Pittsboro, Siler City, Chatham and all surrounding areas. Free Estimates, Small Jobs.